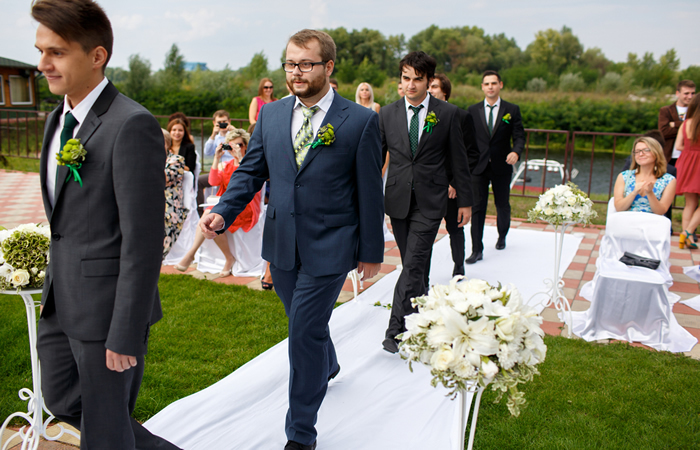 Adorable groomsmen having a stylish parade during a spectacular outdoor wedding event. Coming up with meaningful and unique groomsmen gift ideas for your wedding party can be tough. We know. So, we’ve put together some truly unique and smart gift ideas to help point everyone in the right direction. Perhaps, you’re about to tie the knots. And you’d like to thank your best man and your groomsmen for being part of your special day, right? Great! Basically, the first trick to churning up some unique groomsmen gift ideas is to think hard about something useful that they actually want. There’s no point forking over cash for some meaningless item that’s destined to be stashed away in a cupboard never to be seen again. The ideal gift is something your groomsmen will love, cherish and either put to good use or put on display. Of course, this gift is supposed to represent your gratitude and friendship. So, be sure to step into your groomsmen’s shoes for a minute. You want to think of something that speaks to their personal tastes. Or, it can be something that signifies your relationship with them. This isn’t about you – just because you love vintage red wine doesn’t mean your groomsmen will. Take this opportunity to think about their personal likes and dislikes and come up with something they’ll be thrilled to receive. A good groomsman gift doesn’t have to break the bank, but you don’t want to hand over some shoddy, cheap item that’ll break the first time they use it. Whatever your budget, opt for high-quality items. Who doesn’t love the look of a gorgeous whiskey decanter sitting on a home cocktail bar? Spirit decanters are not only stylish and sophisticated, they’re also practical and can be enjoyed for a lifetime when cared for correctly. High-quality artisan decanters like those available at Prestige Decanters provide a classy gift your groomsmen will love, while optional engraving offers the opportunity for you to include a personalized message. These days, there’s no shortage of subscription services available online. For a gift that keeps on giving, buy your groomsmen a subscription to a service they really love or need. Some popular ideas include craft beer subscriptions, wine subscriptions, whiskey subscriptions, gift box subscriptions and gourmet food subscriptions. Having classy barware is a great addition to any home. What better way to thank your groomsmen? You can order custom engraved coasters and bar trays that allow you to add images or messages of your choosing. This is a popular, traditional groomsmen gift idea–with good reason. Cufflinks can be worn by your groomsmen on the day of your wedding and beyond. So, they’ll have a reminder of the special day every time they wear it. But, if cufflinks aren’t really their thing, consider a unique lapel pin that speaks to each groomsman’s individual personality. The popular expression “experiences are better than possessions” has seeped into the gift-giving world. Many grooms now choose to give their groomsmen unique experiences instead of tangible gifts. Some of the best groomsmen gift experience ideas include hot air balloon rides and fishing charters. Other fun activities – like cooking classes, golf lessons, wine tasting and luxury car rides – also make sense. We hope these ideas will inspire you to find the perfect gifts for the guys you’ve chosen to celebrate your big day with you. Finally, if you’ve got any unique groomsmen gift ideas of your own, we’d love to hear them. And, if you’re looking for more tips for an upcoming wedding, check out our tips for a classy open bar wedding.